Mercedes' Nico Rosberg took a perfectly-judged maiden victory at an enthralling Chinese Grand Prix that was dominated by tyre strategy. Rosberg led Jenson Button across the line by 20.6s as the Mercedes driver bucked the trend by nursing his tyres to make a two-stop strategy work. The gap could have been closer but for a 9.7s final pit stop for Button, which robbed the amassed crowds of a potential grandstand finish. 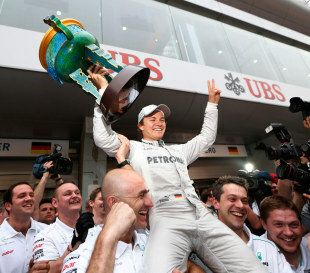 The victory marked Mercedes' first victory since the 1955 Italian Grand Prix. Lewis Hamilton and Mark Webber passed Sebastian Vettel in the final three laps to secure third and fourth as the defending champion struggled towards the end of the race on a 24 lap-old set of tyres and had to settle for fifth. Romain Grosjean secured a solid sixth place after his team-mate Kimi Raikkonen dropped 10 places between laps 48 and 50 on old tyres and eventually slipped out of the points. Mercedes' day was slightly tainted by Michael Schumacher retiring with a loose front wheel after his first pit stop, but it was all smiles in the team's garage as Rosberg crossed the line. There was extra satisfaction as the W03 defied its critics, who had argued before the race that that it would not look after its tyres. In the end, however, cool temperatures meant Rosberg appeared to be the most comfortable on the old tyres after he stopped on laps 13 and 34 without his pace dropping significantly. The two McLarens behind him both three-stopped, but starting from sixth and seventh meant they would always struggle to close the gap. Button got a good start and was running third early in the race before making pit stops on laps 11, 24 and 39, which should have left him on tyres five laps younger than Rosberg's and in a position to attack the Mercedes. However, a sticking rear wheel nut at his final stop dropped him back into the tight pack of cars behind Rosberg and he lost crucial time. Apart from Rosberg, Vettel was the highest-placed two-stopper after starting from 11th on the grid and running as high as second with six laps to go. He finished just a second ahead of Grosjean, who was also on a two-stop strategy, after starting 10th on the grid. The two Williamses also looked after their tyres to finish line-astern in seventh and eighth, with Bruno Senna leading Pastor Maldonado across the line by 1.1s. Fernando Alonso started where he finished, in ninth, but could have been higher placed had it not been for a poorly-judged overtaking move on Maldonado that forced him wide on lap 43 and back to 11th place. He managed to make back two places but has now lost his lead in the drivers' championship to the McLaren drivers with Hamilton on top. Kamui Kobayashi took the final point in tenth after a slow getaway dropped him from third on the grid to seventh at start. He dropped further positions on a three-stop strategy, but the fact that Sergio Perez on a two-stop strategy finished directly behind him proved that Sauber was struggling for race pace all afternoon. Paul di Resta was the highest-placed Force India in 12th and finished directly ahead of Felipe Massa, who again failed to score a point. 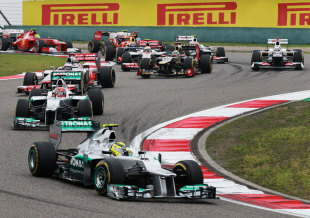 Raikkonen eventually finished 14th after his tyre difficulties towards the end of the race.